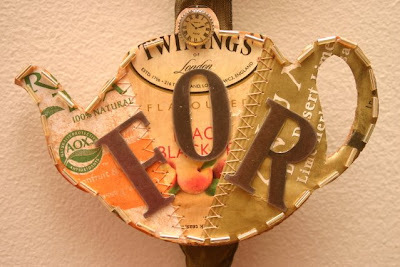 Many, many months ago, I wrote about the Tea Party Challenge being sponsored by Cloth Paper Scissors magazine and their call for tea-themed artwork. 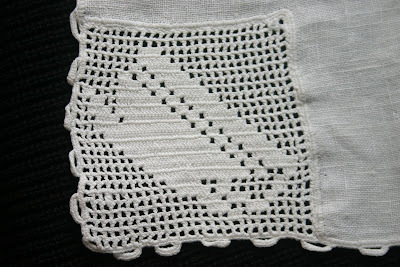 With more than a bit of trepidation, I made a small wall hanging and e-mailed my photos of it to the editors. When I received a "Dear Artist" e-mail from them in July, I was overjoyed to find out my work was being considered for publication! I had to mail them my wallhanging, wondering all the while if A) my little Mod Podged and hot glued creation would survive the postal trip and B) if it would then make the cut for publication. I later got the piece back in the mail with a nice thank-you note and word that the Tea Party Challenge entries would be appearing in two issues of the magazine, November/December and January/February. When mine wasn't in November/December, I just thought oh well, even if I'm not in the next issue, at least I had a good time making the thing! 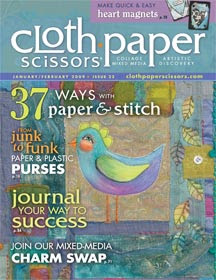 I've been watching the Cloth Paper Scissors website and saw the new cover was up, but it said the new magazine wouldn't hit newsstands until next week. Then yesterday, I was in Hastings where my friend Joanie, who knows more about magazines than anyone else in Newnan, and who knew I'd been waiting for it, told me the new Cloth Paper Scissors had arrived! She very thoughtfully stopped what she was doing to go pull the not-yet-on-the-racks issue for me, and this sweet friend was by my side as I flipped through the magazine and discovered my own artwork inside! How exciting is THAT! I enjoyed seeing the tea-themed artwork in the last issue, and I enjoyed it even more this issue, although I'm surely biased. 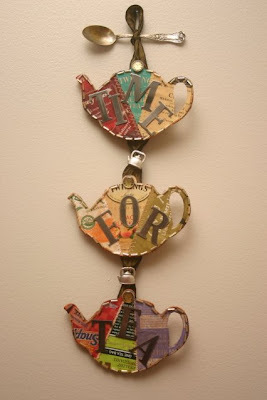 There's a whimsical teapot made from a cigar box, an Australian artist's beautiful green-hued collage, a "heavenly" piece featuring some angelic tea drinkers, a "Tea for the World" piece that used old maps and keys and reminds me of the folk art I so love, a gorgeous "Pink Teacup" painting, a tea packaging collage that is just beautiful and so *perfect* in its execution, and my personal favorite, Florida artist Lisa Mallette's lovely canvases which incorporate text from book pages into her designs of a teapot, slice of cake and cup of tea. What a nice way to end the year in tea! Today, I need your help. I have a simple question, and I'd greatly appreciate it if some of you would simply answer this question: What is the item in the picture? It will be a great help to me if you could be as specific as possible. And tonight, I'll explain why I've asked and what I was trying to find out. UPDATE: OK, your answers have been very helpful! 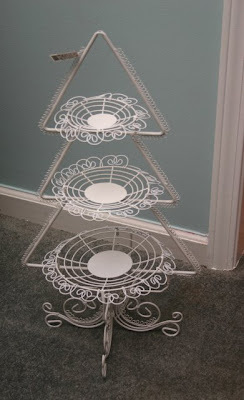 Here's the deal: I saw this three-tiered server in a catalog about a year or so ago and meant to order it but never did. $35 I didn't need to part with and all that. But then I found this at HomeGoods over the weekend, marked $24.99 and then half off that thanks to their Christmas clearance. I immediately saw the Christmas tree shape, but both my mom and my husband said they did not notice that at first, and they would use it for any tea purpose. So, I was just trying to figure out if it said "Christmas" to you as it did me, and the consensus is yes, it does. Also, I should mention that this is supposed to have a star on top, but hey, for $12.50, I can certainly live with my bargain serving piece as-is. I think it can be a serving piece for teatime but I also like your ideas about using it for fruit, cookies, ornaments and more. It's nice to have a headstart on decorations for *next* Christmas! Thanks to friends and family I received lots of nice tea gifts for Christmas, some of which I'll no doubt be sharing in the days and weeks ahead. 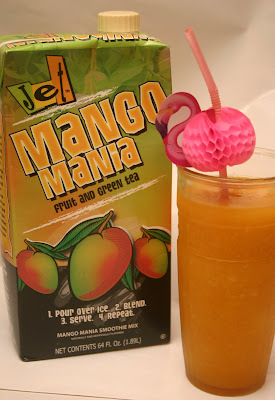 But the most *fun* tea gift I opened this year was this Mango Mania fruit and green tea smoothie mix from my friend Leigh. Jet Smoothies is the company which makes this yummy concoction, and after sipping my first smoothie I headed to their website to find out where I can get more. It says to check back in 2009, and since that's not too far away, I can wait. But I like a company that has a sense of humor. This notice on the package made me smile! What makes this mix so great is that you don't need anything but ice and a blender (I used a food processor) to make it. After all the heavy sweets and treats I've had over the holidays, I was delighted to have a "light" treat to enjoy. This smoothie was every bit as delicious as any store-bought smoothie I've tried. More, actually, since I enjoyed knowing it contains green tea, I loved the delicious mango flavor, and I couldn't get over the ease with which I made it myself. 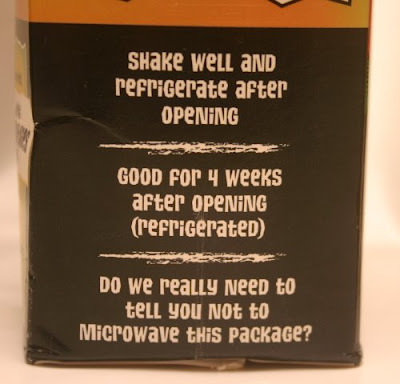 Have any of you tried Jet's smoothie mix, and if so what did you think? All year long, I seem to pick up tea things for myself, but just so you'll know, I do also like to give tea gifts. 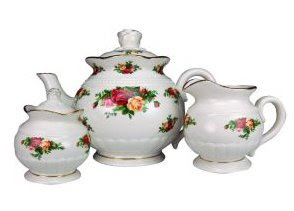 Like this Old Country Roses tea set I found for my OCR-collecting mom at What's in Store, my across-the-street antiques and collectibles store in Newnan. 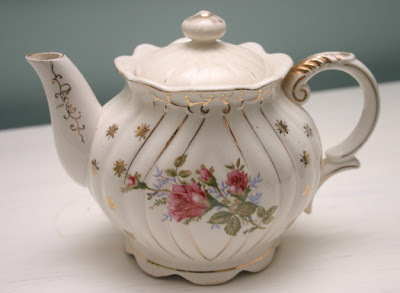 She already has the nice bone china teapot from OCR, but this set had rose-shaped knobs on the teapot and sugar bowl lids, which I thought she would like as well. The set was new, in the original box, with original stickers on the pieces, and was about one-third of the retail *sale* price. No wonder I love What's in Store! 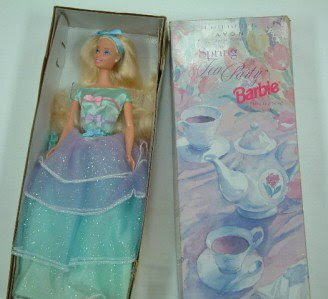 When I told niece Cari some months ago that I had discovered a "Tea Party Barbie" existed on eBay, she said, "Why don't you get it for me for Christmas?" So I did. (Now I want one too!) You can't see it, but Barbie comes with her own little pink plastic tea set down in the bottom of the box. 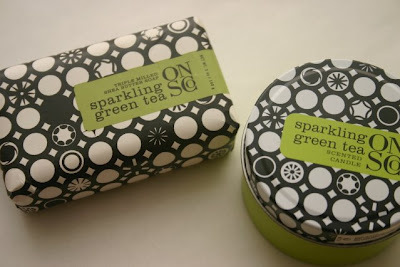 And finally, Old Navy's bath and beauty products this Christmas included green tea soaps and candles, and these rounded out a gift for another tea-loving girlfriend. Of course, now that it's Dec. 26, it's time to go begin shopping for next year's Christmas gifts. 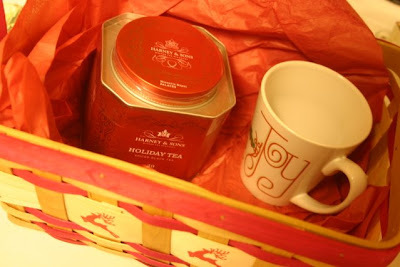 Did you give any tea gifts this year? 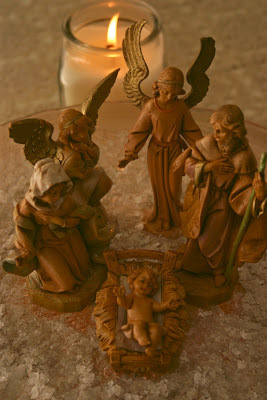 Luke 2:12-14: And this shall be a sign unto you; Ye shall find the babe wrapped in swaddling clothes, lying in a manger. And suddenly there was with the angel a multitude of the heavenly host praising God, and saying, Glory to God in the highest, and on earth peace, good will toward men. Those new brightly-colored tins of Harney tea are so gorgeous, I was mighty tempted to buy one a few weeks back in a Starbucks Cafe, but I managed to resist. So when my friend Holly handed me a pretty red basket packed with Christmas treats yesterday, you know what my eye went right to. The item on the left sure made me experience the emotion on the right! 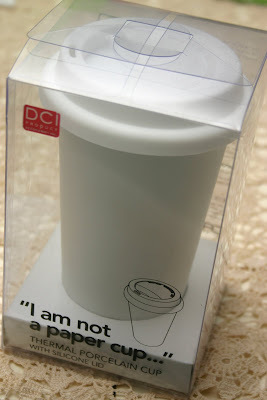 She also (and very thoughtfully) included a bag of Starbucks Christmas Blend coffee for DH (she even said it was for "DH," proving she knows blog lingo) and another mug for him. 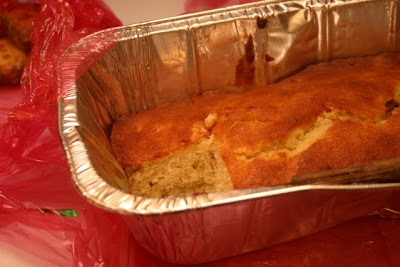 For both of us: Yummy, moist, obviously-freshly-baked banana bread. On Saturday I had the privilege of being the guest speaker for the Lottie Moon Christmas Tea at Moreland First Baptist Church. We enjoyed a delicious buffet-style tea together -- which despite my pre-speech nervousness, I managed to consume with no problem! My friend Sheila, whose family I've known for years, was in charge of the tea, and I was surprised to learn her military husband made the White Chocolate-Macadamia Nut Scones and an unbelievably gorgeous fondant cake with a teacup on top! (Guess who forgot to take her camera?) 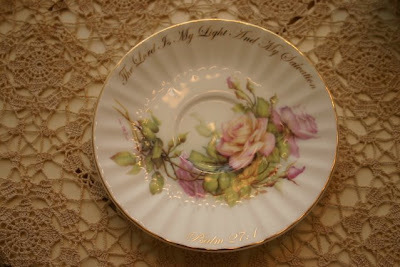 After the event, Shelia handed me a gift and insisted I open it right then, and it was this beautiful teacup and saucer with Psalm 27:1 on it. 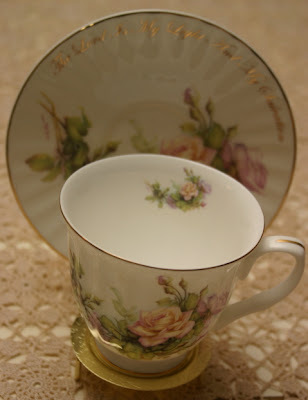 During my talk on "The Gift of Teatime," I had just mentioned how my favorite pieces all have roses on them, so obviously this was a real hit. I don't normally receive - or expect! 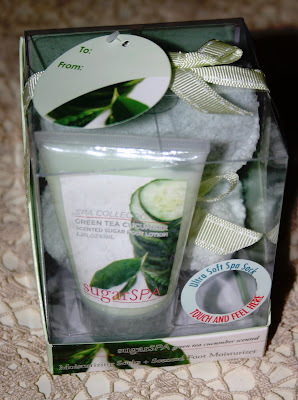 - gifts on the few occasions when I do some public speaking, so I was truly delighted to receive such a thoughtful gift. Some of the ladies at the tea were Red Hatters who came all dressed up in holiday hats and finery, and they were just an incredibly warm and welcoming bunch of ladies. I truly enjoyed meeting them! And I also enjoyed learning a bit more about Lottie Moon, whom I first got to know when I was a little girl. I grew up hearing about this devout young woman, born to privilege in Virginia in 1840, who grew up to become a missionary to the people of China. At my church and many others, funds are collected at this time of year for the Lottie Moon Christmas Offering, which supports international missions. During my research for the event, I found plenty of references to Lottie Moon drinking tea, which is no surprise considering that she was ministering in China. But one of my favorite stories was of how she began making teacakes in order to befriend the children, who instead of calling her that "foreign devil" soon began referring to her as "the cookie lady." Isn't it interesting how food and a cup of tea help us build bridges across our different cultures? I haven't had time to try Lottie Moon's teacake recipe yet (she measures her ingredients in teacups! 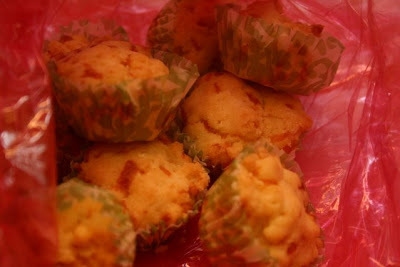 ), but if you'd like to try it, it's here. 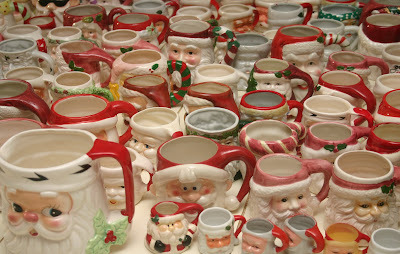 Since it's Christmas week and Santa's visit is just days away, I thought it was time to get out the Santa mugs and see how the collection is faring. (Double click the photo if you want to see more detail on this one.) Thanks largely to my mom, Santa has been joined by quite a few helpers this year, and the collection now numbers 89. 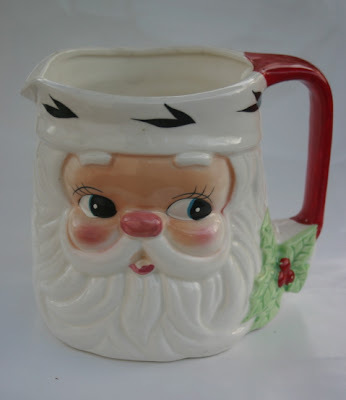 I can't remember if that includes this Santa pitcher or not, but oh well. I'll count them again next year! These three are the latest ones she found for me, and they are the old, classic style Santa mugs and the ones I like best. If you're into Santa mugs, check out the mugs on my Flickr badge at right and you'll probably see some like you have. And don't forget: Santa mugs make wonderful teacups! When my husband and I got married a little over two years ago, we received many lovely wedding gifts from friends and family. Although I appreciated the towels and toaster oven, I have to say the more "everlasting" gifts we received ended up being my favorites: the double wedding ring quilt embroidered with our names and wedding date, a beautiful gift from three friends at work; a lacy vintage tablecloth from a tea-lover friend who knew how much I would enjoy pulling this out at holidays and other special occasions; silver and crystal bowls, not for everyday use but oh-so-nice to have; and the gift that's on my mind today, this wedding set of Merck's Family Old World Christmas Ornaments. I'd heard of these sets before but had never seen them "live." 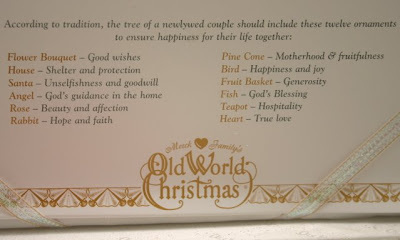 There are 12 ornaments, each representing a characteristic designed to bring happiness to the couple. 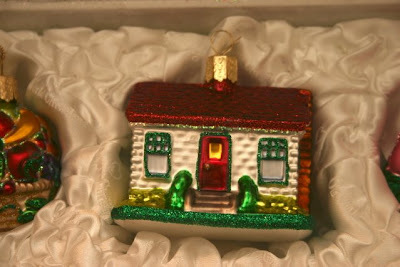 Some of my favorites include the house (representing shelter and protection). The pink rose (beauty and affection). 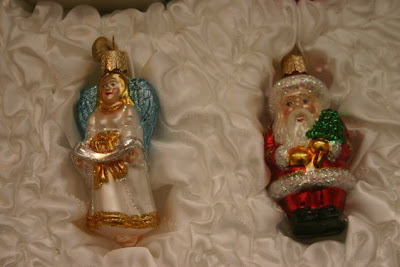 The angel (representing God's guidance in the home) and Santa (unselfishness and goodwill). 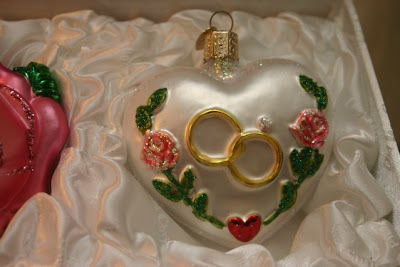 The heart with two wedding rings on it (representing true love, this one goes highest on the tree!). And last but not least, the teapot! It represents hospitality, something I hope to show a little more of in the year ahead. 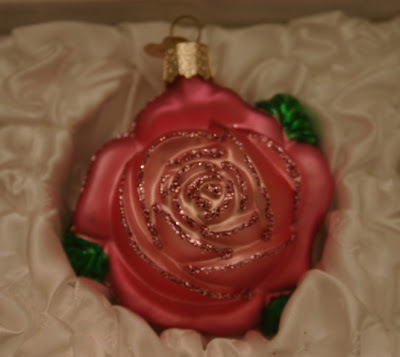 So if you ever want to really treat a special couple in your life upon their wedding, you might want to consider a set of these Christmas ornaments, which are kind of like getting a wedding gift at Christmas every single year. 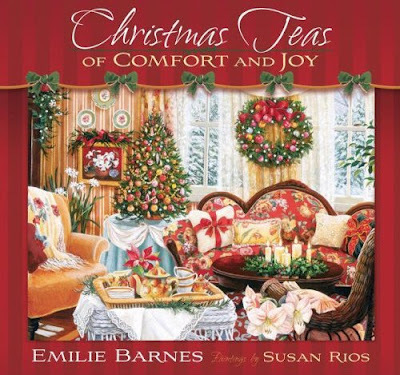 "Christmas Teas of Comfort and Joy"
A new Emilie Barnes book always makes me happy, because I have great respect for her ministry as well as her love for the ritual of teatime. Several years ago she visited my area from her home in California, and I remember traveling to local churches a few times to hear her speak. 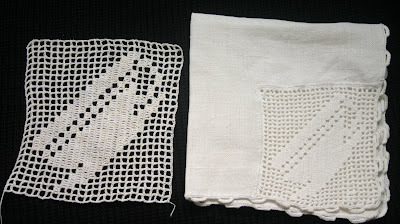 Once, I got to hand her an envelope in which I'd included a crocheted doily I made along with a copy of a newspaper column I'd written about how much I enjoyed her books. She didn't open it then but said she'd look forward to reading my note on the airplane on the way home, and apparently she did. Imagine my joy when a short while later, the office mailbox delivered up a lovely and gracious handwritten thank-you note from Emilie herself! So to say I am a fan is putting it mildly. "Christmas Teas of Comfort and Joy" is the title of her newest book, with paintings by Susan Rios. The text is actually from her past Christmas book, "The Twelve Teas of Christmas," but the paintings are copyright 2008 -- and they are lovely! I really like the cheerful paintings by Susan Rios, and I also enjoyed re-reading this book in a new format. It reminded me of some of the tips I'd heard before, and it also gave me ideas for new things I wish to try, like the Christmas Bread made of balls of dough. If you're a tea lover, I recommend you get at least one of these great books for your tea library! During that recent trip to Florida, I came across several new teas. Among them were these two bottles of SteaZ brand teas. 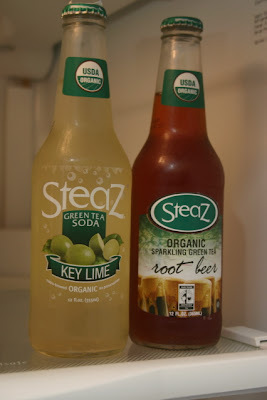 On the left is the Key Lime flavored green tea soda, and at right is the Root Beer sparkling green tea. Now I have to say, I happen to like root beer, but the mere idea of sparkling green tea root beer struck me as pretty disgusting. The combination was bound to be just terrible, but at least I could say I tried it, right? Well imagine my surprise when I loved this tea, which tasted like really, really good root beer. DH tried it too and said he liked it but could taste a little something strange which he assumed was the green tea. I didn't detect anything odd, just a very nice root beer flavor with a teeny bit of zip to it. The Key Lime? It was just your basic mildly fruity drink, and nothing I'd bother to try again. The root beer, however, is another story! I also found this Garasha Japanese Sencha I got primarily because I love the design of the package. 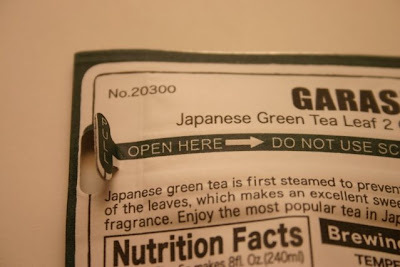 According to the information on the back, "Garasha is the Japanese pronunciation of the Latin 'Gratia,' which is equivalent to the English word 'Grace.'" I like a tea with grace! The dry leaves were a very bright green, and when steeped, I couldn't help thinking they looked just like collards! (Do my northern friends eat collard greens?) 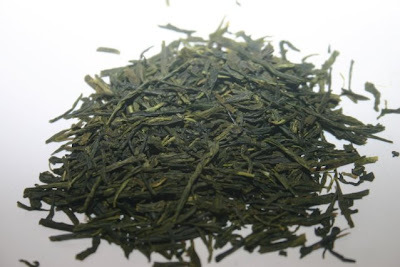 This Sencha tea brews in just 60 seconds, and the flavor was quite enjoyable and not too "grassy" at all. Maybe it's just grace-y! In case any of you woke up thinking "Gee, I wonder what happened in American history 235 years ago today?" well, now you know! This scene on a vintage postcard I found on eBay is "a reproduction of one of the famous murals in the State House at Boston. 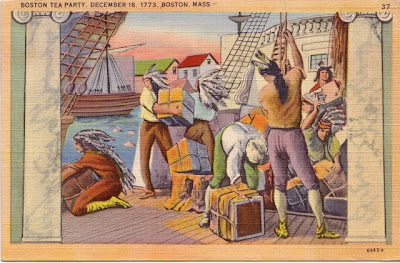 It depicts the historic occasion of the Boston Tea Party when a group of citizens, garbed as Indians, showed their rightful indignation at the exorbitant taxes that King George of England had levied by throwing a whole cargo of tea into the Boston Harbor December 16, 1773." Of course I got this 1943 postcard purely for the image, but I also am intrigued by what's on the back. 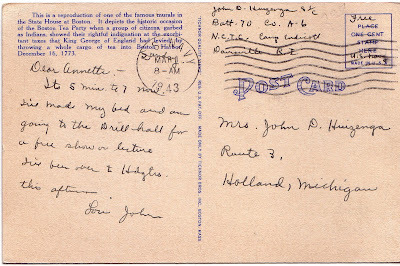 The card is addressed to Mrs. John D. (or P.?) Huizenga, Route 3, Holland, Michigan (double click to see more detail). It reads, "Dear Annette, Its 5 min. to 7 now. I've made my bed and am going to the Drill hall for a free show or lecture I've been over to Hdqtrs. this afternoon. Love John." The card was sent by John Huizenga of Batt. 70, Co. A-6, N.C.T.C., Camp Endicott, Davisville, Rhode Island. Wikipedia says Davisville, Rhode Island was the former home of the U.S. Navy Seabees (CBs, Construction Battalions). "It was located at Quonset Point on Narragansett Bay, an area now included in the town of North Kingstown. The Navy acquired the property in 1939 and built Naval Air Station Quonset Point. In 1942, adjoining properties were developed for training Seabees, including the Naval Construction Battalion Center (NCBC) at Davisville." Perhaps the postcard should have read N.C.B.C. instead of N.C.T.C.? Interesting to ponder, and all because of a little old eBay postcard! This is the time of year that, in addition to preparing to celebrate Christmas, I also start thinking about the new year ahead and what I hope to accomplish. High on that list is "more gardening," and last week I got a new planning tool I thought might be appropriate to share with some of my tea friends who also enjoy gardening. "A Record of the Garden 2009" is the creation of my talented friend Katherine McCall. She writes, photographs and illustrates garden stories for our magazine, and I have been a fan of her artwork for years. When she told me she was thinking of designing a garden journal, I knew I would be one of her first customers, because Katherine's work is first-rate, and I was eager for the opportunity to purchase something with her artwork in it. 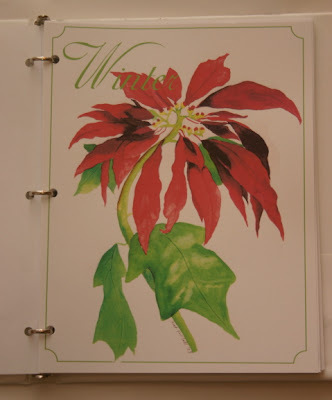 Isn't this watercolor of a poinsettia just gorgeous? It's one of the seasonal page dividers in the garden journal. 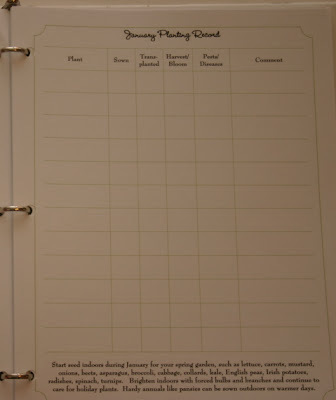 She includes a calendar page for each month where you can record temperatures and conditions, a Planting Record for each month with notes about what to plant when, a page for monthly gardening notes, graph paper for landscape and bed planning, and pages for adding photographs and sketches. I like that I can personalize it and use or not use the pages according to whatever works best for me. Katherine sells this as a "filler set" like other planners you buy at this time of year. 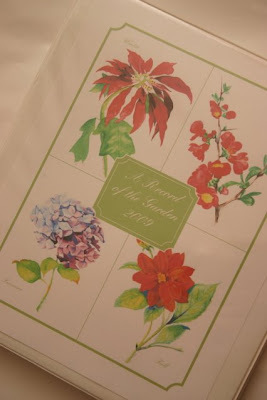 Using your own 1-inch or 1-1/2-inch notebook with a clear insert on the cover, you insert the artwork and pre-punched pages and voila, your own garden journal. The notebook I'm using has pockets at front and back which I will use to hold seed packets and other garden-related bits as I prepare for some organized gardening efforts in 2009. 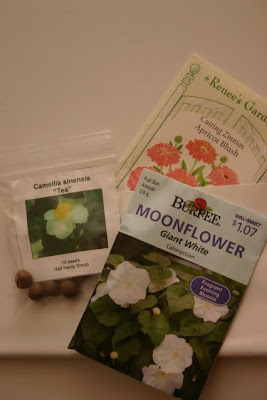 Tops on my list: Trying again to grow my own tea plants! After ordering some seeds from overseas, my effort earlier this year bombed, but I soon realized why. I followed the directions to "file down" the covering on the seeds, but I never saw a sprout of anything once I planted them. My friend Deberah ordered some of the seeds too, but when hers arrived some of them had the outer shell already cracked open. Imagine filing down a peanut shell to get to the peanut when you should have just cracked it. I am quite sure that is why my camellia sinensis did not get off the ground (literally), but thanks to my new garden journal I am optimistic about trying again in the new year. I bought journals for myself and as a Christmas gift for a gardening friend, and if you want one for yourself (they're $15 + shipping), I checked with Katherine and she assured me she could get them to you in time for Christmas if you order now. If you're interested, visit her Thoughtful Gardener blog for a link to her Etsy shop ... or just enjoy the gorgeous photos she shares, and you'll see why I'm such a fan of her writing and art! Maybe shopping Florida antique malls the first week of December is just a good idea. All I know is, last Saturday, my DH was busy preparing to watch the Florida-Alabama football game on TV, and I was clearly asking too many questions and was soon encouraged to head on out and shop. So I headed to Pensacola and hit every antique mall I found along the way. At one, I saw a beautiful Wedgwood china-handled tea strainer and matching drip bowl, a set I've never seen before, but it was $35 and I just thought that was a bit much. Bad economy, Christmas gifts left to buy, yada yada. When I got to Franklin Antiques in Pensacola, I was glad I passed on the tea strainer, because I found several items that have long been on my wish list, including this full-size musical teapot. 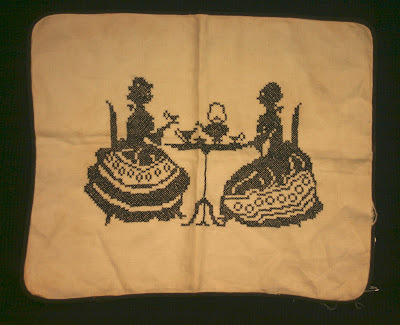 It plays "Tea for Two" (of course), and I'd seen these on eBay before but been outbid. This one, in great vintage condition, was just $12.95, and I got 20% off that without even asking! 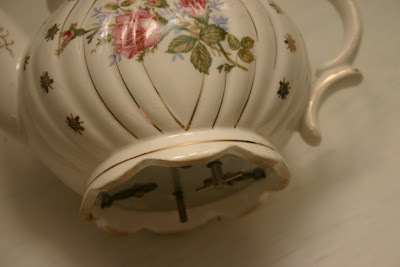 I had always wondered where they "hid" the music box component. 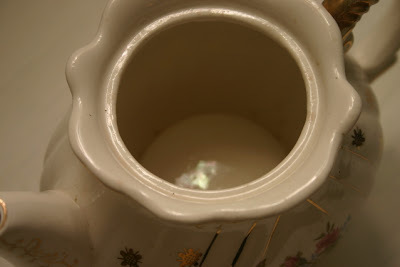 I hope you can tell from the photo, but the "bump" looking up at you from the interior is where the music part resides, so the teapot is completely usable. I cannot wait to use this in the new year! I'd also been wanting one of those Art Deco looking teapots with a stainless "cozy," and this miniature teapot and matching creamer (I guess) were also $12.95 for the set ... but I got 10 percent off. I don't know about the prices where you live, but in my neck of the woods these prices are pretty terrific. 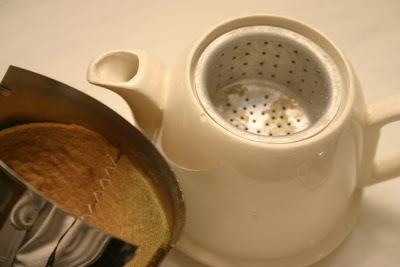 And inside, this little teapot contained a surprise: The cozy's lined with felt and the pot comes with its own strainer. 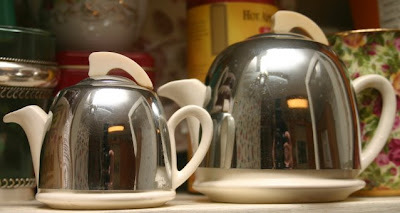 Now obviously I need the matching sugar bowl, so if you see one somewhere, please send a cyber shout-out! 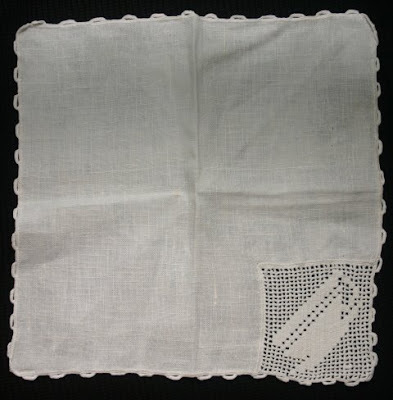 OK, so this is the fourth day I've mentioned that day trip to Fairhope, Ala., and it's the last day I'll mention it, I promise, but I've been dying to tell you -- especially the needleworkers -- about the great vintage napkin I found! I was finishing up browsing in this antique store, and slowly walking back out, when I glanced at a rack of vintage linens and thought, "Wait a minute! Is that ..." and it was. A teacup! 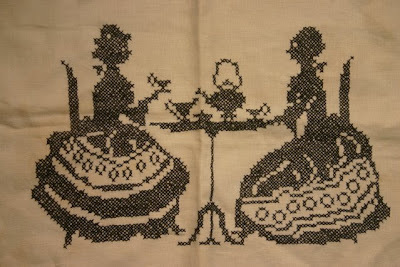 Later in the week, I came across another great piece of vintage needlework at Miss Donna's Antiques in Navarre Beach. She has a lovely antique mall, great prices, loads of different stuff, and that's where I found what once was a pillow cover. The pillow form has since been removed, but I wanted this for the "art" and, possibly, for the pattern. I haven't copied it yet, but give me time and I just may give it a try! 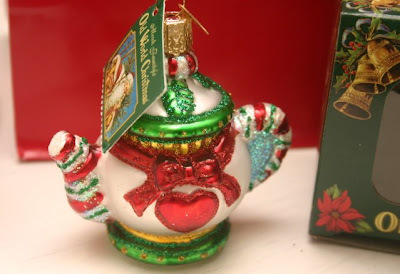 Have any of you come across new teacup or teapot Christmas ornaments lately? 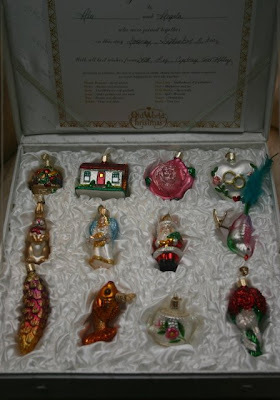 The only ones I've seen are little porcelain ornaments at T.J. Maxx, and I've already got quite a few of those. 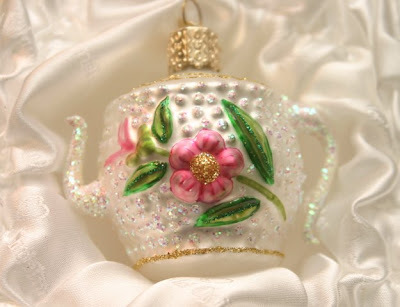 They also had some of the cloisonne teapot ornaments, but those are a bit too Asian looking for my frou-frou pink feather tree. 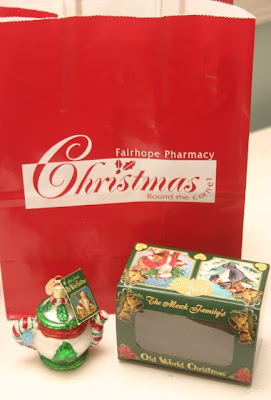 So, I was happy to find, at the Fairhope Pharmacy's Christmas Round the Corner Shop, this Old World Christmas teapot. I love that it has a different design on the back! 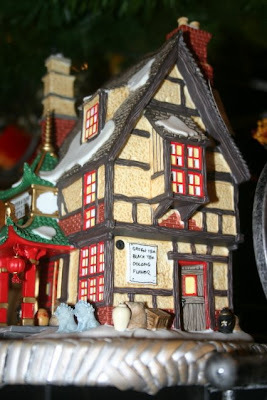 And as I was at the counter ponying up for my ornament, I happened to glance up and saw this building in a Christmas village on display. A tea shop! The clerks in Fairhope were all quite friendly, and the one here graciously permitted me to snap a photo. 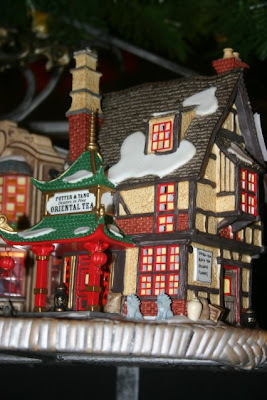 I've never collected Christmas villages, and don't intend to since I already collect too much stuff as it is, but ... isn't this adorable! Turns out it is from the Dept. 56 line of Christmas collectibles. If one of you would like to buy it, I'll come visit it! A Dollar Tree Tea Party? "Porcelain & Pottery Tea Tiles"
Happy 70th, Spode Christmas Tree!